Thanks to David Wilson, son of Sgt Bernard E. Wilson (Left Gunner, Anonymous IV) and several members of the crew. 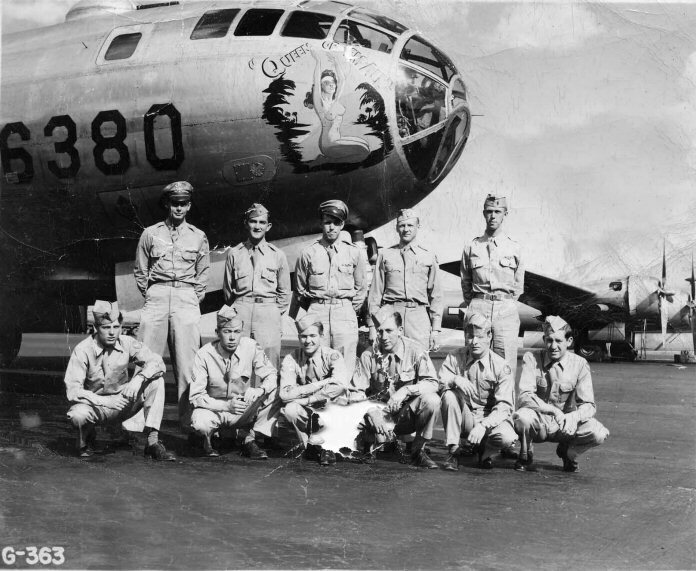 The crew of Anonymous IV in front of "Queen of the Air", a plane they may used in training. Photo provided by Bernard and David Wilson, all rights reserved. Standing - Left to Right: 2/Lt James A. Brewton (Pilot), 2/Lt Charles E. Pickett (Bombardier), 2/Lt James C. Airman (Navigator), 2/Lt Phillip R. Pilling (Radarman), 1/Lt Lt John C. Howett (Aircraft Commander). Kneeling - Left to Right: Sgt Bernard E. Wilson (Left Gunner), Cpl Jack B. Denny (Right Gunner), Sgt Malcolm W. Douglas (Engineer), Sgt Raymond S. Raetz (CFC), Sgt James C. Bishop (Radio Operator), Cpl Marion L. Long (Tail Gunner). 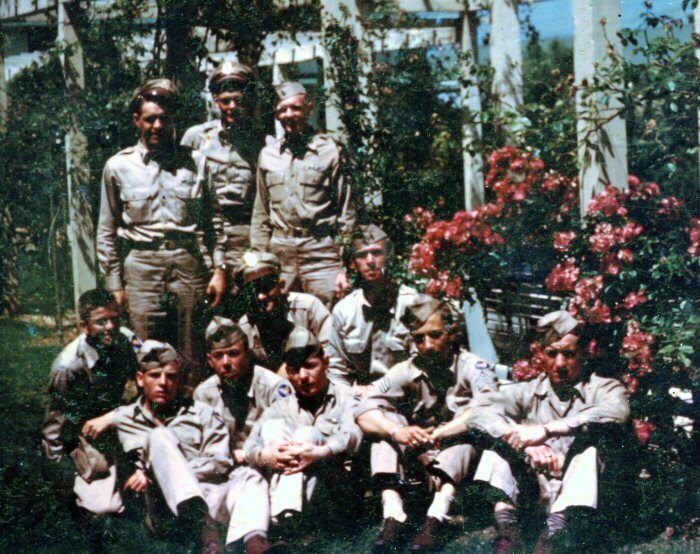 A rare color photo of the crew taken around May 30, 1945 - on the day before they shipped out. This picture was taken at the Officers Club at Mather Field, California. Standing - Left to Right: 2/Lt James H. Aiman (Navigator), 2/Lt James A Brewton (Pilot), 2/Lt Phillip R. Pilling (Radar Man). Kneeling - Left to Right: Sgt Malcolm W. Douglas (Engineer), 2/Lt Charles E. Pickett (Bombardier), 2/Lt John C. Howett (Aircraft Commander). 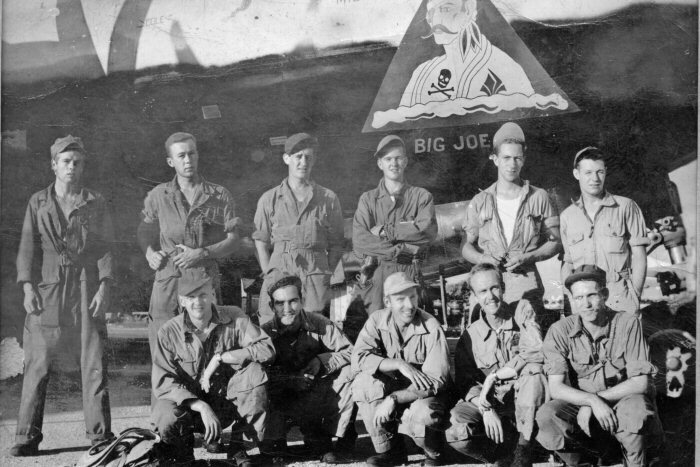 Sitting - Left to Right: Cpl Bernard E. Wilson (Left Gunner), Cpl Jack B. Denny (Right Gunner), Sgt James C. Bishop (Radio Operator), Sgt Raymond S. Raetz (CFC), Cpl Marion L. Long (Tail Gunner). Kneeling - Left to Right: 2/Lt Phillip R. Pilling (Radarman), 2/Lt Charles E. Pickett (Bombardier), 1/Lt Claude A. Johnstone (Aircraft Commander of Big Joe), 1/Lt John C. Howett (Pilot), 2/Lt James C. Airman (Navigator). The flight log of Cpl Jack B. Denny (Right Gunner) indicates the missions they flew. As was standard for 6BG replacement crews, the crew flew their first missions with an experienced aircraft commander. In this case, they flew in "Big Joe" with 1/Lt Claude A. Johnstone as A/C while Lt. John Howett manned the Pilot seat. At the same time, Lt. Brewton flew as pilot with another crew, probably the previous crew of "Big Joe" and Wayne Maki as A/C. Later, the crew was assigned to aircraft #10, which they named "Anonymous IV". Brewton would be returned to the crew as Pilot and Howett would move to the A/C seat after each gained valuable experience under the tutelage of an experienced A/C.